It’s hard to imagine the Ghent street scene without Negenduust’s presence. This cool and trendy clothing brand from the capital of East Flanders is run by and for people from Ghent. 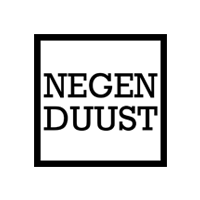 In fact, the name “negenduust” (which means nine thousand in English) is a reference to the city’s postal code. The slogan of the company is, roughly translated, “It’s true we’re chauvinistic, but it’s not our fault our city is so beautiful!” Negenduust presents an image of a clothing company that’s proud of their city, giving the number 9000 a central spot on their sweaters, T-shirts and other merchandise. Aside from that, they also produce headgear, and they have a kid’s collection as well. The smartphone cases of Negenduust feature the same style as their clothing. That is to say, fun and pretty backgrounds with the number “9000” or the word “Negenduust” written at the center. These backgrounds include geometric shapes in black and white, and even a gorgeous space nebula, among other things. It’s easy to understand why Negenduust is so popular over here. So, if you want to pay homage to Ghent, easily the most beautiful city in our little country of Belgium, this is your chance!